clark street, part three. the 2500 block of north clark street has yet to disappoint: korean bbq at del seoul, pizza by the slice at cafe luigi and now, spam hand-rolls at aloha eats! 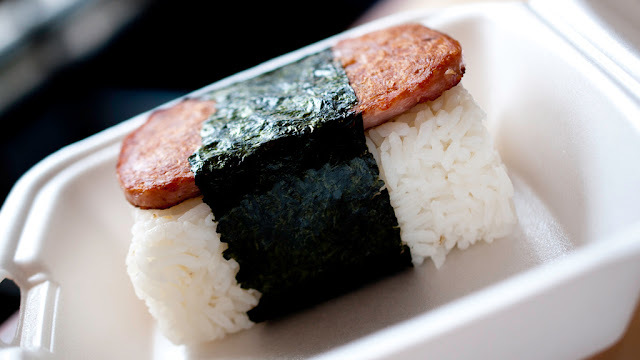 it's called a spam musubi, and like everything at aloha eats, it's authenticly hawaiian. did you know that hawaiians consume more spam per capita than any other state in the country? while we aren't adding this canned, precooked meat product to our diets, try the musubi simply for its uniqueness. aloha is known for its traditional hawaiian "plate lunches" like the chicken katsu, a boneless, skinless filet breaded in panko, fried and served with a sweet and tangy dipping sauce. (splurge on the white meat for an extra 45¢.) we had the katsu combo, which came with thinly sliced bbq beef in addition to the chicken. (we'll be going back for more of that beef!) then there's the loco moco, two hamburger patties, two eggs and brown gravy. did we enjoy our meal? absolutely. did we eat enough for four people? as usual, yes, but lito's empanadas is less than half a block north and they serve choco-banana and apple cinnamon empanadas for dessert. no words, the pictures say it all. stay tuned for their savory empanadas and clark street, part four! so macaroni salad is the pbligatory side dish/ garnish for each dish? love it. haha. check their hours but we don't think they are open for breakfast! Spam is spam. Dressing it up in a hula skirt doesn' make IT any more appetizing though. Fantastic atmosphere, impeccably captured. Well done Cousins.